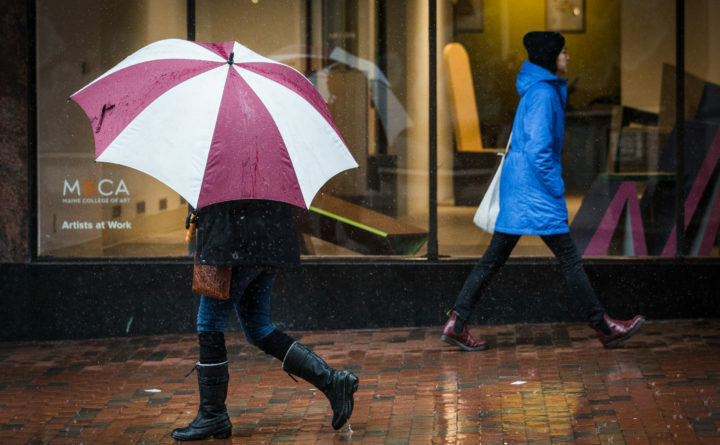 Rain falls on Congress Street pedestrians in Portland. Heavy rain followed by high winds was expected to cause some flooding and power outages Saturday into Sunday, according to the National Weather Service. A flood advisory was issued for York, Cumberland and southern Androscoggin counties until 10 a.m. Saturday where two inches of rain has fallen in some areas. An intensifying low pressure system approaching from the mid-Atlantic region will move across Maine this afternoon into Sunday morning, according to the weather service in Caribou. A wind advisory has been issued for all of Maine from 4 p.m. Saturday until 7 a.m. Sunday. Winds are expected to blow between 15 and 25 miles per hour with gusts up to 55 miles per hour. That could cause tree limbs to fall on power lines and cause outages, the weather service warned. Scattered power outages were reported Saturday morning by Central Maine Power and Emera Maine. As of 9:15 a.m., the total number of customers without power was less than 200, according the companies’ websites. In addition to those warnings, a gale warning was issued to mariners for the entire coast of Maine from 2 p.m. Saturday to 2 a.m. Sunday. Winds up to 25 knots with gusts up to 45 knots were predicted. Temperatures throughout the state are expected to drop overnight into the 20s and low 30s. Sunshine was predicted to break through Sunday as the winds diminish.